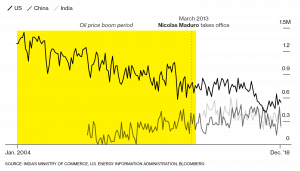 Oil is at the center of the Venezuelan economy. It accounts for 95 percent of the country’s export revenues and bankrolls the regime of President Nicolas Maduro. Now, with protests spreading across the country and the U.S. recognizing opposition leader Juan Guaido as the interim president, the situation in the country is becoming more unstable by the day. U.S. President Donald Trump is said to be considering imposing sanctions on imports of Venezuelan crude, a move that would hurt some American refiners as well as deal a fresh blow to the Latin American nation’s oil industry. The decline in Venezuela’s oil production, which began under Maduro’s mentor Hugo Chavez, has accelerated in the past two years. As output plunges toward 1 million barrels a day, the lowest level in seven decades, the country is running out of cash to pay for food and medicine. Salaries can’t keep up with hyperinflation, last estimated by the IMF at an absurd 10 million percent. Living in a country where the price of food can change within hours prompted more than 1.5 million Venezuelans to flee the country in the past four years. 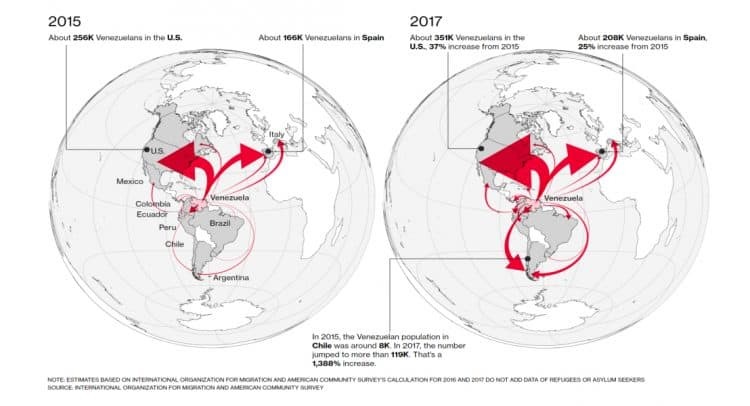 The United Nations estimates there are 3 million Venezuelans living abroad, including some 2.4 million spread across Latin America and the Caribbean. Those seeking to leave the country who can’t afford black-market rates can face days-long lines to get passports. U.S. banks became more careful about giving credit to U.S. refiners to buy Venezuelan crude, fearful about a potential outright ban on imports. International oil companies operating in the country cut investments amid concerns that they would be seen in violation of sanctions. 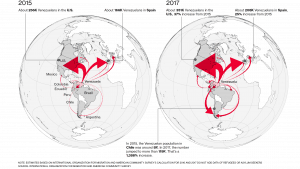 Venezuela’s dwindling production has reduced the country’s influence across Latin America. 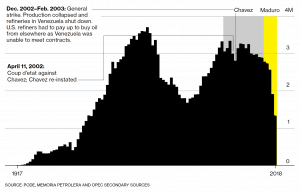 Where Venezuela once provided subsidized oil to neighbours, now it needs to hoard all it produces in order to be able to pay bondholders, as well as China and Russia, which have loaned almost $69 billion in the past decade in exchange for oil. So far, the government’s solution was a selective default that’s estimated at $6.1 billion of international securities. Loans granted by the Chinese Development Bank and Russian oil company Rosneft Oil Co PJSC have been either renegotiated or paid with delays. A bond that PDVSA continues to pay is one secured by its interest in Citgo, its money-earning U.S. refining arm. 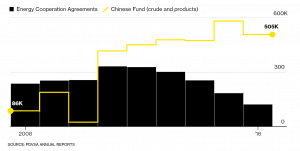 Short of cash, Venezuela pays its debts to China and India with oil. With output falling, Petroleos de Venezuela SA has starved its own refineries. While U.S. refineries are running close to their maximum, the ones in Venezuela are operating at less than a quarter of capacity. The result is fuel shortages, especially in the countryside, adding to the pain of Venezuelans. The manoeuvres haven’t been enough to stop a fall in crude oil exports that pay debts and bring in necessary cash for the economy to function. Shipments fell by almost a quarter in the past two years. Lately, companies have been successful in using courts to force PDVSA to pay some debts. ConocoPhillips strong-armed PDVSA to agree to pay a $2-billion settlement—related to asset seizures carried out in 2007, under the late president Hugo Chavez—after obtaining court orders blocking the Venezuelan oil company from using its extensive network of oil terminals in the Caribbean. The court orders also prevented PDVSA from running its refinery in Curacao, which shut due to a lack of oil. PDVSA agreed to pay Conoco, signing over cargoes of oil to the U.S. company to free up the terminals it needs to store and re-export crude and fuel oil. Signs point to further trouble for the country’s oil industry. Even as Venezuela borrows another $5 billion from China to almost double oil production that’s fallen to a seven-decade low, analysts see output sinking further this year, to below 1 million barrels a day. The U.S. State Department has urged U.S. citizens to leave and President Donald Trump is said to be considering imposing sanctions on imports of Venezuelan crude, a move that would hurt some American refiners as well as deal a fresh blow to the Latin American nation’s oil industry. In the longer term, a new regime could result in higher production if it welcomes back international oil giants to repair and expand its fields.